This document shows how to remove Spam and Trash from your domain email account. Log in to Webmail using your domain email address and password. If your email has been accumulating on the OlympusNet mail server, email will bounce if usage is at capacity. You’ll receive a notice by email ahead of time. More capacity can be added at a higher cost. See Services Pricing for increased storage space. Otherwise, to quickly claim enough space to get email working again click on the bars beside the Spam folder, and select Empty Folder. 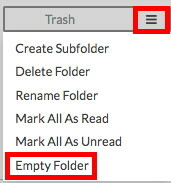 If there is a lot of Trash, click on the bars and select Empty Folder. If you are using IMAP, you’ll have to begin deleting the unneeded email from the inbox, emptying the Trash folder as you go. Usage is listed immediately above the Inbox, so you can check the percentage of available space while removing mail. 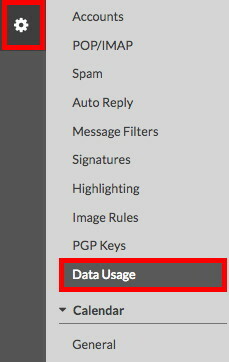 Or, you may also click the gear icon in the dark gray margin, and select Data Usage, to see which folders contain the most email. Call support to discuss if you aren’t sure whether you’re using POP or IMAP, and for help managing your email to prevent storing it on the server.